For their first Afro-Brazilian compilation the German Jazz & Milk label teamed up with Tahira, one of São Paulo’s most active DJs andmusiccollectors. 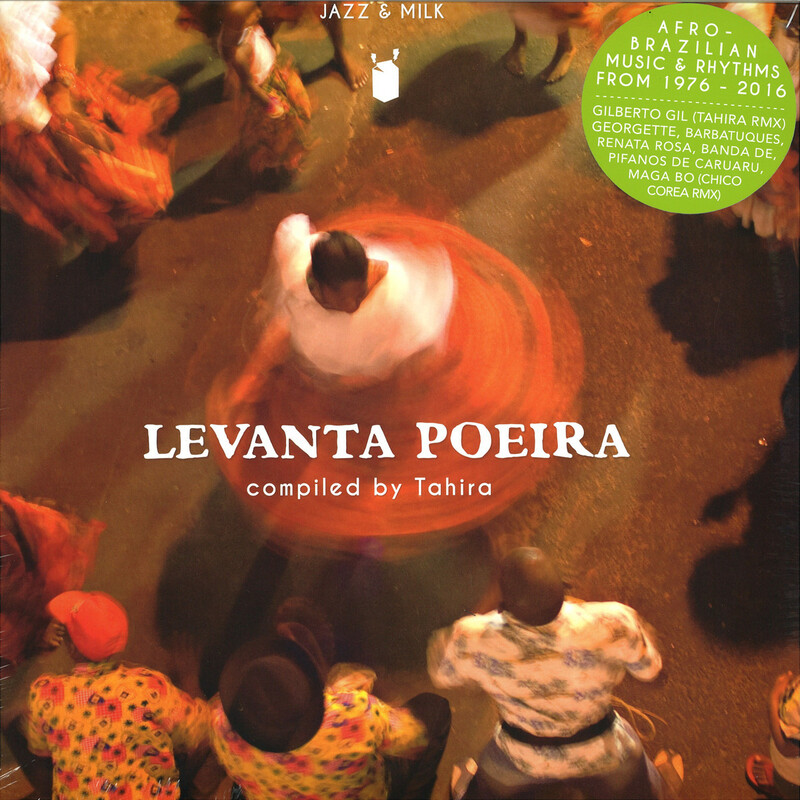 Levanta Poeira (Afro-Brazilian music & rhythms from 1976 — 2016) highlights a few of his favourite DJ pearls and encompasses Brazil’s various regional musical styles influenced by African and Amerindian forms. While most foreign music lovers tend to approach Brazilian music by having American music genres such as Jazz, Soul, Funk, Disco as a reference, Tahira’s personal wish was to showcase the rich musical roots and facets of his country by featuring carefully selected artists and bands from the past 4 decades. 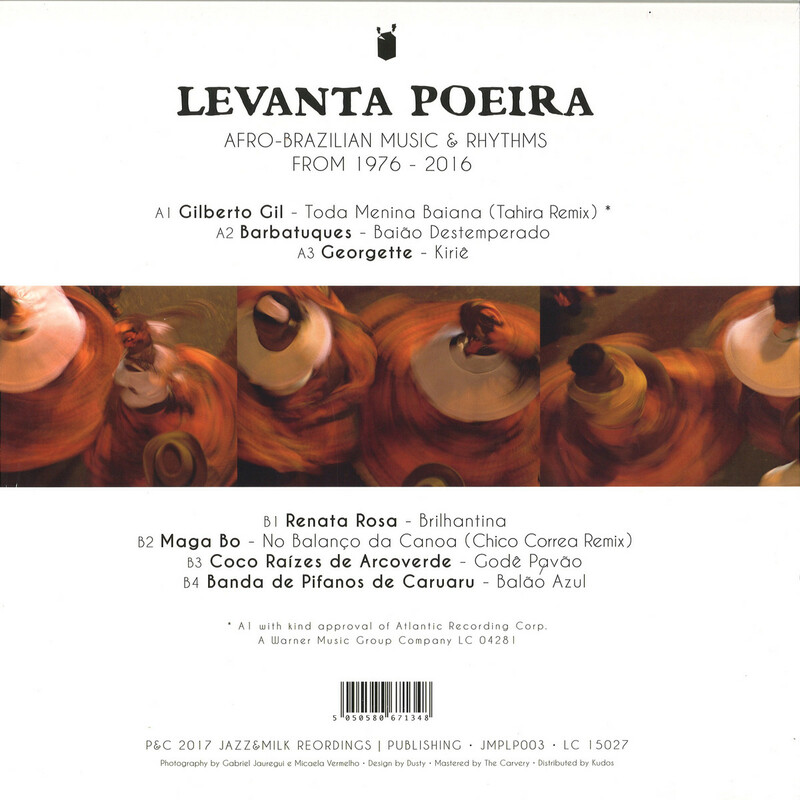 Most of these tracks will be made available on vinyl for the very first time with a highlight certainly being Tahira’s «A Toda Menina Baiana» remix (vinyl-only) of one of Brazil’s absolute musical heroes, Gilberto Gil. Tahira is a well known character and good soul of São Paulo’s music and digging community, regularly searching through record shops, private collections or dusty attics around the country. The passionate DJ dedicated the past four years extensively researching Brazil’s broader spectrum of musical styles and slowly started to introduce more and more African and indigenous elements in his DJ sets. Encouraged by the great acceptance and success during his shows he decided to curate his first compilation project to share his discoveries with the world. «Levanta Poeira» is a popular Brazilian expression meaning «kick up dust.» This is a phenomenon that can be found throughout the country, a cultural manifestation that exists where people gather to play, dance and party. Earth is hit by the foot of the dancers raising a cloud of dust. It is a sign that the heat of the Brazilian spirit is present! The compilation starts of with a key figure of Brazil’s music scene. Since the 1950s, the Genius Gilberto Gil has been gifting us with countless musical blessings. Very few artists were able to not only explore but embody the diversity of Brazilian music as well as he did. Gil’s endless row of classics include the wonderful track «Toda Menina Baiana» which has been revisited by Tahira himself. Adding Ijexá beats, as well as Afrobeat stlye guitars and a horn section on top of the original, Tahira managed to make this legendary song attractive to a young and modern audience. The remix starts of with a long percussion intro, builds up very slowly before finally introducing the first vocal verse — an arrangement especially designed for DJs who love to mix and blend brazilian rhythms in their sets. This remix will be available on vinyl only! Established in 1995, Barbatuques from São Paulo developed different techniques of body percussion, vocal percussion, tap dance and musical improvisation in their collective experiences. «Baiao Destemperado» is a Forró (a genre of Brazilian music that originated in Northeast) with the famous Barbatuques body percussion trademark. A truly unique and outstanding piece of music! Back in 1976 Georgette or Georgete da Mocidade recorded «Kiriê» -a track produced by the genius Ed Lincoln, a pioneer of sambalanço, a very groovy music style which mingles samba rhythms and American jazz. The Afro influences on this track are unmistakable. The simple foundation of guitars and percussion create a very warm and electrifying sound layered by Georgette’s beautiful vocals. The rhythmic pattern of the percussion intro is called»Congo de Outro», an Afro Brazilian rhythm with Bantu origins that heavily inspired modern producers and laid the foundation for Baile Funk. Renata Rosa is a contemporany artist that blends sounds of the northeast area of Brazil in a very unique way. On «Brilhantina» her indigenous influenced voice fits wisely to the Samba de Coco rhythms. Its´s an outstanding track from the beginning to the end and a good example of how powerful and bass-heavy percussion-driven music from Brazil can sound these days. Renata Rosa manages to present Brazil’s musical roots in a modern guise, celebrating widely unkown facets of Brazilian music culture. Global bass producer Maga Bo continuously explores the contours of Afro-Brazilian culture including many collaborations with some of the biggest talents in Brazil’s vast musical landscape. His track «No Balanço da Canoa» was remixed by another production pioneer Chico Correa who was one of the first to blend Brazilian sounds of the norheast with electronic beats back in 2003. On his remix he modernized the traditional style of the original version by adding flutes, synth basslines and strong electronic Coco stlye beats. Coco Raízes de Arcoverde are influenced by elements of indigenous and Afro culture. The band was formed in 1992 by Lula Calixto and the Irmãs Lopes. After a while the Irmãs Lopes split up to form their own band but Lula Calixto kept playing with Coco Raízes and made his whole family become part of the group too. They play a kind of Coco style ryhthm called Trupé, in which they use wooden sandals as a percussion instrument, strongly reminding one of clap sounds, which can also be heard in the intro of «Gode Pavão» — a very powerful song impossible not to dance along to! Around for more than 90 years, Banda de Pífanos de Caruaru are one of the oldest bands in South America. They started in 1924 with Manoel Clarindo Biano and Benedito Clarindo Biano in Alagoas, but recorded their first album not until 1972 after Gilberto Gil recorded Banda de Pifanos’ track «Pipoca Moderna» as part of his album «Expresso 2222». Unfortunately the originators Manoel and Benedito Biano have passed away but the band continues the tradition with their sons and nephews. The musicians play several self made instruments like drums and «pífanos» (fife flutes). «Balao Azul» is a very happy song for the dancefloor!